In the west, the road is closed due to a railroad crossing failure on The Drove both ways from Ivors Lane to the A275. Network Rail is in attendance. The road is also closed due to a railroad crossing failure on Spatham Lane both ways from Middleton Common Lane to Mid Sussex Golf Club. Elsewhere the road is shut due to the same problem on the B2140 Station Road both ways from Angmering Way to Coach House Close. The road is also closed due to a railroad crossing failure on Goring Street both ways from A259 to Chatsmore Crescent. Elsewhere in Sussex slow traffic is affecting the A21 at Fair Lane in the construction area. Temporary traffic lights are in operation. 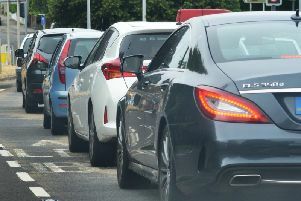 There is very slow traffic on the A24 Great Daux Roundabout Northbound from B2237 Warnham Road (Robin Hood Roundabout) to A264 (Great Daux Roundabout), as well as slow traffic on the A24 Warren Road Eastbound from A27 Crockhurst Hill (Offington Corner) to A27 Grove Lodge Roundabout (Grove Lodge Roundabout). There is also slow traffic due to a traffic signal failure on A2023 Nevill Road at A270 Old Shoreham Road (Hove Park Pub Traffic Lights). The traffic lights are all stuck on red, near to the Hove Park Tavern. On the trains ice is preventing trains getting electricity from the third rail between Littlehampton and Brighton, as a result of this, Southern said some lines are blocked. Train services running to and from these stations will be cancelled, delayed or revised. Southern, which runs the services, said disruption is expected until 9am.